TORONTO - The 2016 edition of the annual Yule Log Tournament saw teams Riverdale High and The Hockey Sweater skate to a 4-4 draw after three periods of play, prompting a title-deciding shoot-out. Riverdale High goaltender Marc Hickox turned aside the full compliment of opposing shooters, while Hockey Sweater keeper Luis Freitas was solved just once, ceding victory to the opposing squad. And yes, Simon Evers (back row, holding up eight fingers) was on the winning team, maintaining his unprecedented run of eight consecutive Yule Log championship titles. Special thanks to Dan Hickox (who snapped the above photo, among many others) and to team GMs Rodney Merchant, Stephen Cribbin and Eric Toth. 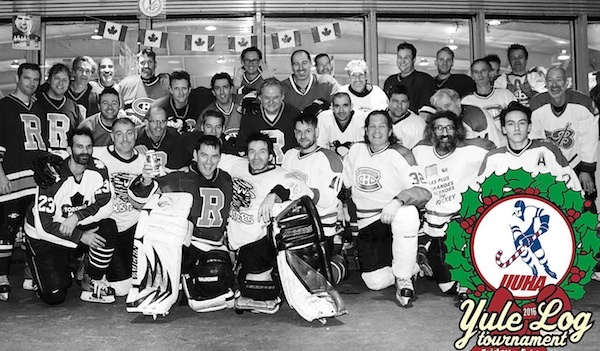 On behalf of all Yule Log participants, here's hoping 2017 yields a net full of fun and friendship for all, both on and off the ice.